It’s beginning to look a lot like fall! As the chilly weather begins to take over the valley, the healthy food options seem to dwindle. One healthy food that thrives during the fall is the underrated pumpkin seed. 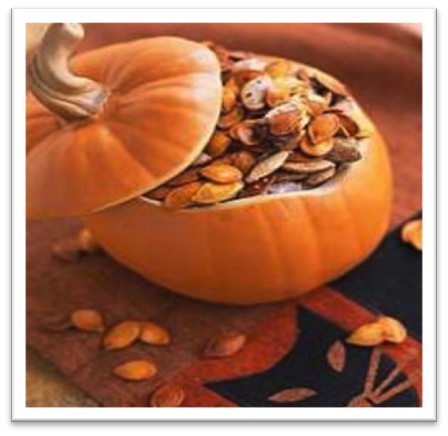 So when Halloween pumpkin carving rolls around this season, instead of tossing those pumpkin seeds in the trash, roast them and give your body a healthy boost! Pumpkin seeds have a multitude of amazing health benefits. They are high in magnesium and antioxidants, which both play a huge role in heart health. They are also full of zinc, which gives your immune system a boost. They can help regulated sleep and mood because they are a good source of tryptophan. Tryptophan is converted to serotonin and then melatonin, often referred to as the “sleep hormone,” in the body. Pumpkin seeds have also been linked to improved insulin regulation and helping reduce oxidative stress, which is a very natural way to help with diabetes. Pumpkin seeds, along with most other raw seeds and nuts, contain a lot of omega-3 fatty acids. According to the Cochrane Collaboration, more and more scientific studies have proven that there is a definite link between consumption of omega-3 dietary fats, particularly DHA, and improved cognitive function. These fats are believed to be involved in preserving nerve cells in the brain in better condition for longer periods of time, therefore helping prevent the cognitive decline that is seen in dementia. Not only are pumpkin seeds great for you, they are tasty and easy to prepare! Roasting them in the oven is a simple and delicious way to prepare them. Or if you are really feeling stressed and busy, most grocery stores sell them already prepared to eat. They are the perfect snack to take on the go to class or work because they are small and mess-free but full of essential nutrients. So for you busy health nuts looking for your fall health fix, keep these nutrient-dense seeds in mind!